From stars and rocks to rock stars, the largest of the Canary Islands is packed with attractions, says Lesley Bellew. Here’s how to make the most of them in just 24 hours. 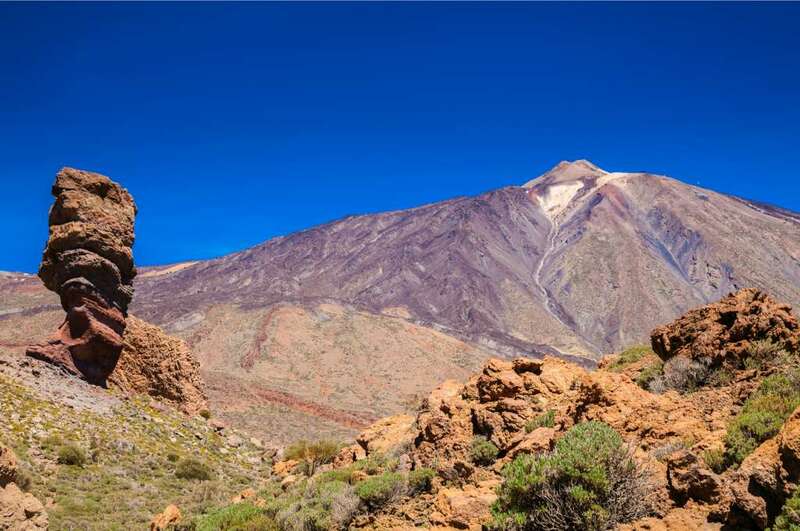 Tenerife’s superstar, Mount Teide National Park, offers an inter-planetary, quite extraordinary experience for all ages. The dormant volcano is in the centre of the island, about 90 minutes’ drive from the capital, Santa Cruz de Tenerife, so make a day of it. The road from the coast to Mount Teide zig-zags through vineyards and up into laurel woodlands. On the ascent, you’ll notice the temperature drops about one degree every 150 metres. 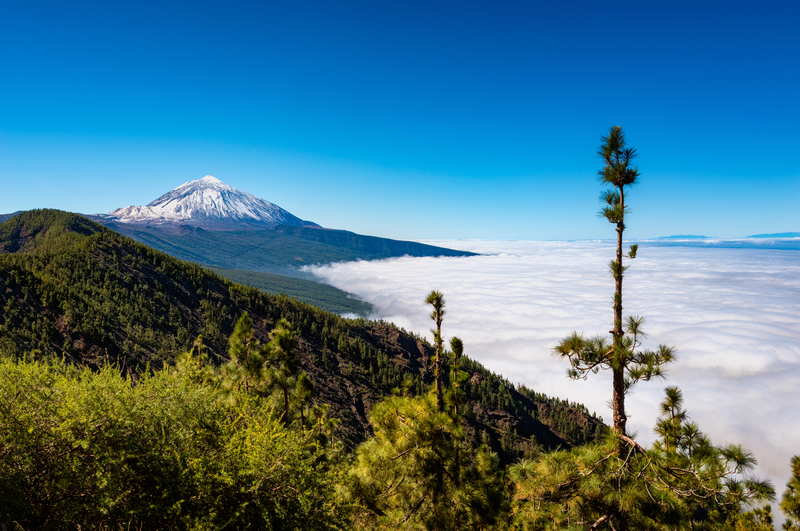 At 1,500 metres, the robust Canary Island pine trees catch the clouds and you start to travel through swirling mist. At 1,750 metres, it’s a heavenly experience to emerge above the clouds and be welcomed by a burst of sunshine and clear blue skies. Blink again and you arrive in the Valley of Ucanca, a reddish-gold desert where cacti cling to life in lava rock that has formed itself into gigantic, freakish shapes. It’s no wonder that One Billion Years BC and Clash of the Titans were both ﬁlmed in this eerie wilderness. Mount Teide is a UNESCO World Heritage Site so numbers visiting the 3,500-metre summit are limited, and you need a permit for the Telefonica cable car. It takes eight minutes to make the sharp ascent – and expect to step out into zero degrees. That’s not the only thing to get your head round as you look down into the 18-kilometre-diameter Las Canadas crater – it’s probably the nearest you can get on Earth to a moonscape. You can choose one of three paths to climb another 200 metres to the peak. Don’t rush. Take a breather to appreciate the 360-degree panorama, and reﬂect on the fact that only 10 per cent of Tenerife is above sea level. The descent is no anti-climax as the desert plain offers plenty more walking (and some scrambling) around the rock formations. The Roques de Garcia are like giant melted candles, survivors of the cataclysmic landslip that created the caldera. Allow yourself time to explore the glistening black, blue and green volcanic landscape with its extraordinary plant life. Ships’ excursion teams usually offer a variety of walks with a guide, ranging from gentle strolls to strenuous hikes. Top athletes train here, and the likes of Sir Bradley Wiggins and the Brownlee brothers have all found the warmth, altitude, gradients (and peace) of the National Park conducive to their race preparation. Stargazers, too, are drawn to this lonely place where they can enjoy the clear night skies. Watching the sun go down from Mount Teide is a magical experience, best followed by an astronomy session to complete a truly out-of-this-world day. With almost no light pollution to get in the way, an expert will show you the North Star, Venus, numerous constellations and the occasional shooting star – or was that Bradley Wiggins? Stargazing and hiking tours fill up quickly, so book early. Wear layers so you won’t be cold at altitude, and don’t forget your permit for the cable car to Teide’s summit (shore tour teams can arrange this). 2. FANCY A DAY JUST WANDERING? 9.30am Stroll from the port into Santa Cruz de Tenerife’s main square, La Plaza de Espana, to discover one of the town’s hidden gems – an underground museum. Look for a stairway signposted San Cristobal Castle Interpretation Centre to see the extraordinary ruins of the town’s castle below the square. You can also learn how Admiral Lord Nelson sailed into Santa Cruz de Tenerife with 900 men on July 25, 1797. Nelson’s force could not defeat the town, and the admiral also lost part of his arm in the battle. El Tigre, the cannon used to ﬁre the shot that injured England’s greatest naval hero, is on display. 10.30am It’s time for coffee and shopping on the main street leading from La Plaza de Espana. For a quick pit-stop, Palmelita is a lovely old-fashioned establishment at Calle del Castillo 9, serving the most delicious cafe con leche (milky coffee) and toast with local ﬁg jam. 11am Get in touch with your creative side at the Tenerife Fine Arts Centre, a lively gallery just along from Palmelita at Calle del Castillo 43. It’s a lovely space for artists to show and sell their work (and seek inspiration at Tenerife’s only vermouth bar!). Prices are mostly accessible, though a local collector recently sold some original works by Salvador Dali, with prices in the tens of thousands. 12 noon To stretch your legs a bit further, take a stroll up from Calle del Castillo to the botanic park of Garcia Sanabria in Rambla de Santa Cruz. An oasis of palms and cacti, fountains, shaded avenues and bougainvillea-clad pergolas, this peaceful park is worth the trip. It’s also home to the stylish Strasse Café, open from 8 am to 2 am for al fresco dining, cocktails and dangerously good desserts. Sit upstairs for lunch on the terrace – and to get a bird’s-eye view of the park. 2 pm If your green ﬁngers are still twitching, Santa Cruz de Tenerife’s Palmetum is a hop, skip and jump from the cruise port on Avenida de la Constitucion. Here, Europe’s largest collection of palms grow on what was a 30-acre landﬁll site. This eyesore once blocked views of the sea and the Anaga mountains but is now transformed into a botanic garden. The ﬁrst plants began to arrive in 1996. By the turn of the millennium advisers from the Royal Botanic Gardens at Kew had evaluated the Palmetum’s collection as the best and biggest in Europe. To ﬁnd out more, visit palmetumtenerife.es. 4 pm Don’t miss Auditorio de Tenerife, the capital’s emblematic theatre, which looks like a huge white sailing boat. Also on Avenida de la Constitucion, this is home to the city’s symphony orchestra and it’s worth checking out what’s on while you’re in port as there are regular opera, classical music and ﬁlm festivals – even on Christmas Day. See the programme at auditoriodetenerife.com. 3. BEEN THERE, DONE THAT? TRY THIS! 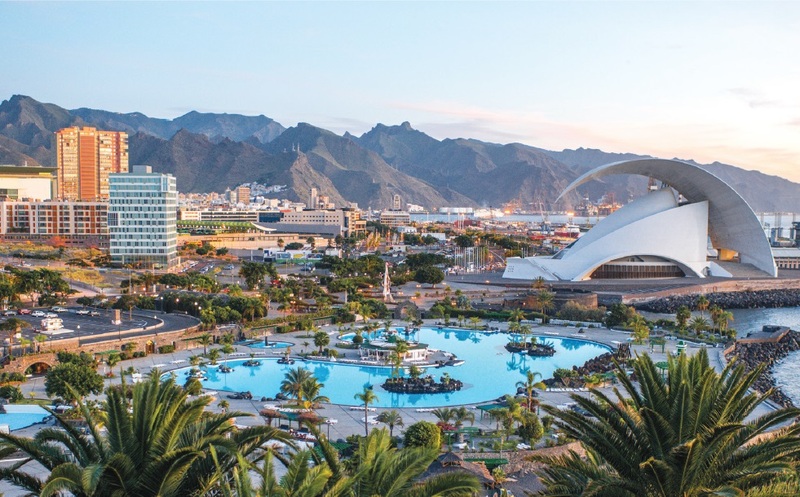 Join Rock Royalty at the new Hard Rock Hotel Tenerife, in Playa Paraiso near Adeje. A £20 day pass buys you access to the three sparkling swimming pools, a saltwater lagoon and cool kids’ clubs (although it’s always best to book). But this ﬁve-star resort is all about the music, and you’ll hear it absolutely everywhere – at reception, in the lifts, at breakfast, during pool aerobics and in all the bars and restaurants. If you’re into the latest Mannequin Challenge craze there’s plenty of opportunity to pose next to models wearing everything from Elton John’s ﬂamboyant feathered gown to Frank Sinatra’s tux. 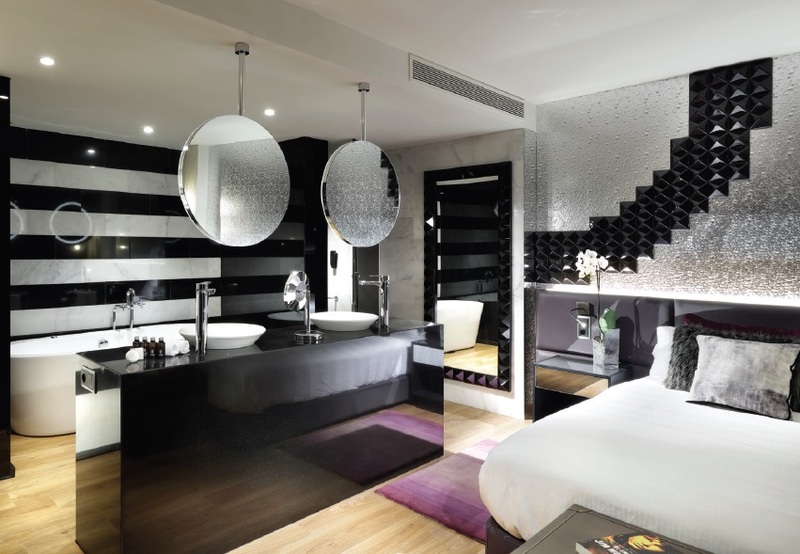 The hotel is also on-trend with memorabilia from the rock icons of today. See Beyoncé’s bikini top, Lady Gaga’s latex bodysuit, and a harmonica played by Bruce Springsteen. Then start a family rock treasure hunt to ﬁnd handwritten notes, lyrics and documents marking signiﬁcant moments in the careers of David Bowie, Madonna, Amy Winehouse and The Temptations. If all that running around stokes your appetite, you’ll ﬁnd a choice of six restaurants – Ali Olé for Mediterranean food, Narumi for Asian fusion, Montauk for steaks, Sessions for an all-day buffet, The Third Half sports bar for burgers and The Beach Club for healthy cuisine. The Roxity Kids Club is a place where four to nine year-olds can enjoy treasure hunts, a rock talent show and a mini disco, while the Teen Spirit Club offers hip hop workshops, DJ classes and Xbox competitions. If you are arriving in Tenerife for a ﬂy-cruise and have time to stay longer, rooms start from £280 per night based on two sharing, including breakfast. Get the timing right and you could enjoy a concert at the hotel’s lagoon-side outdoor stage. To book day passes or rooms, visit hrhtenerife.com. 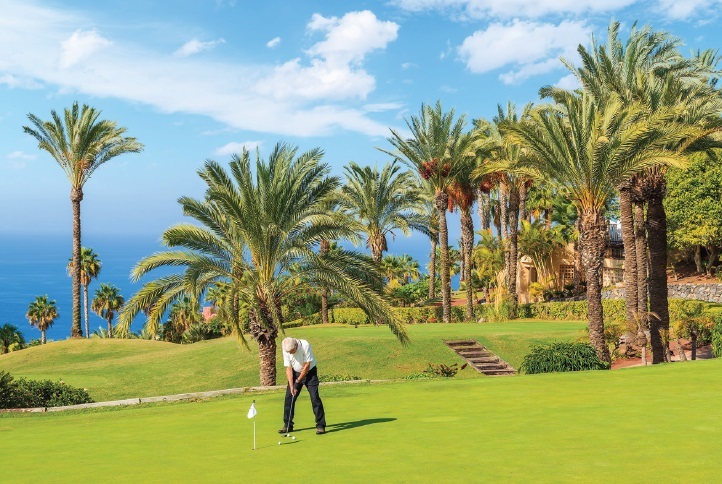 If you prefer more peaceful pursuits, Tenerife’s year-round balmy temperature makes it a slice of paradise for golf lovers. There are eight courses – catering for pros, beginners and all levels in between – and each one offers a different experience, with hallmark black sand bunkers and impressive water hazards. Some are designed by the golﬁng greats, such as Severiano Ballesteros, but the nearest course for passengers sailing into Santa Cruz de Tenerife is the 18-hole Real Club de Golf de Tenerife, a 15-20 minute drive from the port. The second oldest golf club in Spain, this rises to 600 metres above sea level, offering a spectacular view of majestic Mount Teide. If you fancy a round, arrange a golf trip though your cruise line or visit webtenerife.co.uk.